One of the most recommended tourist attractions in Ubud, Bali Pulina Agro Tourism is a must see for lovers of nature, flora and the scenic landscapes. Located close to the rice terraces of Ubud, this agro tourism plantation is developed to educate visitors about various plant species, where you can take guided tours and observe thousands of species in their natural habitats. 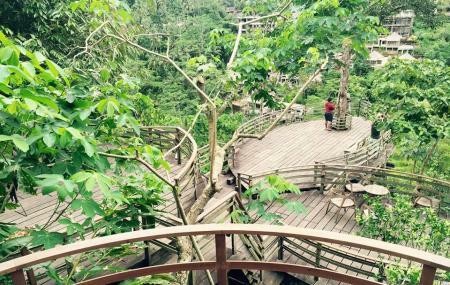 The nature park also has a coffee plantation, where visitors are welcome to taste free coffee. One can also learn and experience Kopi Lewak, said to be the most expensive coffee in the world. The fascinating coffee process, which passes coffee beans through the digestive tract of the local civet cat, is worth writing home about, even if you feel uncomfortable to actually try the coffee. So, do visit this hidden gem of Bali’s rather vast portfolio! How popular is Bali Pulina Agro Tourism? People normally club together Tegalalang Rice Terrace and Tegallalang Rice Terraces while planning their visit to Bali Pulina Agro Tourism. We visited this place after the rice terraces and highly recommend it! The guides speak good English and give a good short tour describing the coffee process. There’s a lovely cafe too with a great view of rice terraces and there is also a swing too (charges 200k). We did enjoy this coffee plantation after researching. The luwaks looked very healthy and clean which is important and they told us they are let out in the wild at night, it's trainer brings them back. Our host was very informative and answered all our questions. We tried lovely teas and coffees and we did buy a few. Beautiful setting in a peaceful gorgeous scene. Great lovely service and we also got to cook some coffee beans! This was a great stop with a quick and free detailed tour of a coffee plantation process. The detailed and interactive tour finished with great views and free samples of all of the drink products. These products are all available for purchase at a high price in the gift shop. Amazing view and good information about a lot of different plants they have over here. As well, good quality in the coffees and teas. Astonish view! Great place and very informative. The staff is super friendly and knowledgeable. The swing is not the best as the valley underneath is full of trees l.. So u don't get the feel of the depth properly. Luwak coffee is a must try..